My Idea for the Zotac Ion is easy and not too fancy. First take one of the smallest mini ITX cases available, for me it was the Apex MW-100. Then I gutted the crappy 60W power supply i came with for more room and better ventilation. I fitted it with Zotac Ion AU, only because I prefer the power going directly into the motherboard. 2 SSDs,2x2gb OCZ and a slim optical drive, only for the comfort of less modding and also the performance and space issue. 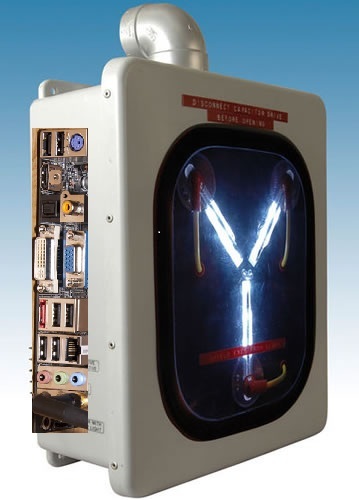 Spray the whole box with gray paint and out of a piece of thin sheet metal, rubber lining, cold cathode, and acrylic glass, magically turn my case into a Doc Brown's Flux Capacitor. Thanks for the opportunity and Good Luck to Everyone.